“MANAN VIDYA MANRAKHAN MAHTO SCHOOL RATAN” – is awarded to the most outstanding students who excel in studies, conduct, behaviour as well as co-curricular activities (together with 50% remission of the school fees) on the basis of merit during the corresponding year. The house forum of Manan Vidya was formed on 17/04/12. Respective head boys and head girls were declared for all the four houses and duties were assigned to both students and teachers. 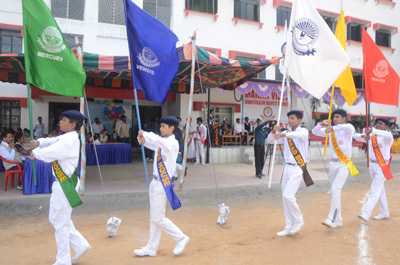 This develops a spirit of team work and leadership qualities among the students. The students looked too much enthusiastic in these house activities.